Spring is here once again. As we bid farewell to the cold of winter and welcome the new season’s sunny days and fresh air, it’s also the perfect time to declutter and beautify our living spaces. 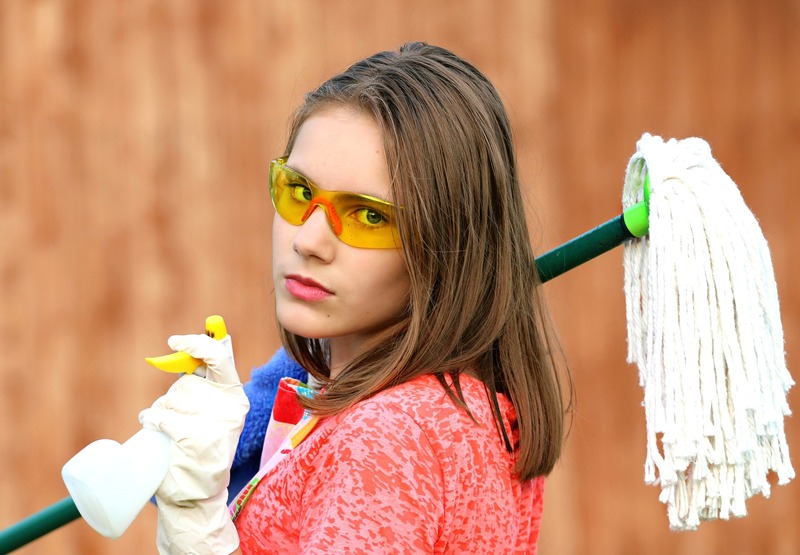 Besides, there’s no better way to welcoming spring than to get your home clean and tidy, don’t you think so? Use baking soda to disinfect stainless steel sinks. Do you find it hard to scrub your bathroom sink? All you’ll need is a sponge and baking soda! Wet your sink, sprinkle it with baking soda, and use the sponge to thoroughly wipe it until it looks completely spotless. Before cleaning your carpet or sofa, see to it that you’re using the right cleaner. Keep in mind that not all upholstered furniture pieces can be cleaned using the same cleaning agent, which is why you must familiarize yourself with the different labels found on various cleaning products. Place towels under your furniture when rearranging. Are you tired of seeing your living room with the same old setup? Give it a do-over by rearranging the couches, coffee table, and shelf! Just make sure you have rugs or towels underneath them before moving them to their new spots to avoid damaging the floor. Freshen up your rooms with the scent of a beeswax candle. Perhaps one of the best parts about welcoming spring is the warm spring air that enters our home as we open our doors and windows. However, if you can’t seem to air out the winter smell despite numerous efforts, try placing a beeswax candle instead. As long as it’s all-natural with a mild scent, your house will smell like a relaxing paradise in no time. Repurpose old socks into dusting mitts. Since cotton is ideal for catching dust or dirt particles, using a pair of old socks as dusting mitts can be a great way to keep your home exceptionally dust-free. Prevent showerhead mineral buildup using white vinegar. Don’t you just hate seeing mineral deposits or particles slowly accumulating in your showerhead? Vinegar is known for its capacity to dissolve mineral deposits that reduce water flow and pressure in your shower. By wrapping your showerhead overnight with a plastic bag filled with vinegar, your water flow and pressure would be back to normal. Tame the toilet with Tang. If you’re a fan of the powdered fruit juice Tang, you’ll have another reason to love it more. Surprisingly, the citric acid found in it can actually serve as a scrubber, and it’s completely non-toxic! Generously spread Tang powder in your toilet bowl and allow the powder to sit there for several minutes before flushing your toilet. Any task done properly gives the best result, and vacuuming is no exception. To leave your bedroom neat and dirt-free, be sure to move your furniture first to the side, vacuum the area as much as possible until you’re satisfied, and return the furniture back to its place. Also, we suggest you start in the farthest corner and work your way toward the door, with repetitive back and forth motions. Although there are various types of brooms available in the market, most people don’t bother to distinguish one from the other, assuming that there’s no difference among them. This isn’t exactly the case. If you’re sweeping indoors, a broom with finer bristles work best, while one with stiffer and stronger bristles is more preferable when you’re cleaning outside. Scrape pet hair from your rug with a window squeegee. Pet owners know only too well how annoying it can be to remove pet hair from their carpets and furniture. If you’re in this situation, you can remove dog or cat hair on your carpet with the use of a window squeegee. When you move the squeegee back and forth across the carpet, its rubber edge can easily loosen hair from fabrics. You may use a vacuum cleaner to make sure that you’ve fully rid the room of unwanted hair. Clean dirty mirrors and windows using old newspapers. Instead of old rags, clothing or paper towels, use the crumpled page of a newspaper to wipe your windows and mirrors. For best results, mix 2 cups of water, 1/4 cup of white vinegar, and 2 teaspoons of liquid soap. Pour the solution into a spray bottle, spray it on the window or mirror, and then wipe the surface using the crumpled newspaper. Why newspapers? Compared to paper towels, newspaper fibers are more rigid and will not separate and cause lint. Don’t you just hate wasting your time looking for your daughter’s misplaced earrings? With a container or crate for lost items in the house, no family member of yours will have to rummage from room to room for their misplaced things anymore. Protect your floor with a wash-and-wax floor cleaner. No one likes the sight of a dirty floor in their home. To protect your floor and keep it shiny, apply a floor cleaner that cleans and shines your floor at the same time. If your floor is made of wood, you’ll need to make use of a wood cleaner along with a paste or liquid polish first before you can add a new wax coating. Remove smudges from your screens using coffee filters. Have you been noticing smudges on your computer monitor or TV screen lately? Don’t worry, a coffee filter will do the trick of removing those smudges. Just remember to press as gently as possible! If you have an old and unwanted vehicle that’s just collecting dust in your garage or backyard, donate it to a charity that can make good use of it. If you donate it to us at Goodwill Car Donations, we’ll transform that vehicle into a vital tool that can uplift the lives of the disabled and other disadvantaged people in your community. We will auction off your donated vehicle and use the proceeds to support the critical programs of the Goodwill organizations in your area. These programs offer various essential services for the benefit of disadvantaged residents in your community such as skills and job training, career development and placement, scholarships, youth employment, livelihood, disability benefits support, and other community-building support services. To show our appreciation for your support of our cause, we’ll take care of all your paperwork, tow away your vehicle for free, and promptly deliver to you your 100% tax-deductible sales receipt following the sale of your donated vehicle. With this receipt, you can claim the maximum allowable tax deduction when you file your itemized federal income tax return in the next tax season. For more information on Goodwill Car Donations, check out our FAQs page. If you have questions, call us at 866-233-8586 or send us a message online. You can make your car donation by filling out our secure online donation form here. Make a Difference in Your Community with Your Car Donation! Imagine how much difference you can make in the lives of the disadvantaged people in your community with your donation of a vehicle you no longer need anyway. Call us at 866-233-8586 and get started with your car donation!